Publication Information: Random House. 2014. 368 pages. Favorite Quote: "Ease isn't the goal; excellence is." Ed Catmull is one of the founding fathers of Pixar, the creators of movies such as the Toy Story trilogy, Finding Nemo, Monster Inc., Cars, and Up. He is the current president of Disney and Pixar Animation Studios. In 2009, the Academy of Motion Pictures Arts and Sciences (aka the Oscar Academy) awarded him the Gorden E. Sawyer award for his lifetime contribution to computer graphics in the motion picture industry. In this book, Ed Catmull tells the story of how Pixar came to be and what he feels was and is responsible for its success. In part, this book is a memoir beginning with Ed Catmull's college and post graduate work, through the birth of Pixar, through its growth, and to the present day. In part, this book is his "thoughts for managing a creative culture." I am a huge Pixar and Disney fan. As such, I really enjoyed his memories of the creation of the movies I have so loved. I also enjoyed reading about the technology behind the movies and what it takes to create that art. Finally, I am also interested in interpersonal skills and management skills so I enjoyed reading the different approaches to foster the creativity that resulted in these movies. Trying to address all three in one book is a big task. The book brings to light the details in all three of these arenas. To focus on one, I find myself filtering through the other two. The part I appreciate the most is the history of Pixar as an organization and a culture. I especially enjoyed the anecdotes of learning to work with Steve Jobs. So, pull out the management details and read it as a case study in effective management. Pull out the personal stories and read it as a memoir. Focus on the creative process and read it for a movie history. Well told, interesting, but you need to put your own filter on the information you want out of the book. Publication Information: Karl Blessing Verlag. 2012. (original German). Other Press LLC. 2013. (translation). 388 pages. Book Source: This book is a sequel to the book The Art of Hearing Heartbeats which I loved. Favorite Quote: "Not all truths are explicable, and not all explicable things are true." Several years have passed from the point at which The Heart of Hearing Heartbeats ends. Julia has not returned to Burma since that original trip almost ten years ago. She is living her life alone, having ended her last significant relationship. She is successful in her career. She still sometimes receives letters from U Ba, her half-brother in Burma. Yet, she does not respond. One day, she begins to hear a voice in her head. Someone who leads her to question where she is in life and the choices she makes. Someone who causes her to walk away from her job. Someone who makes her question her own sanity. She wants to make the voice stop. This leads her back to Burma and introduces the ideas of past lives and souls that need resolution of that past. It leads her to the story of Nu Nu. That story is one of war, of loss, and of choices. It leads to the story of Nu Nu's children, who lived the consequences of their mother's choices. It leads to new life choices by Julia. I spent the bulk of this book comparing it to The Art of Hearing Heartbeats. Perhaps that is unfair, but that is what I did. This book is not the fairy tale the first one was. This book is a much darker story. This book is less lyrical and poetic, perhaps because of the darkness. While the first book was about unconditional love no matter what the circumstances, this book is about the loss associated with love. "Every great happiness entailed a correspondingly great sorrow. That every beginning already contained its own end, that there was no love without the pain of parting, that every hand eventually turned cold." I enjoyed this story, but not as much as I did the first book. I do not know what my reaction would have been had I not read the first book. As U Ba says in this book, "I have no point of comparison .... That is the secret of a happy life." Publication Information: Tarcher/Penguin, Penguin Group, a Penguin Random House Company. 2014. 256 pages. Favorite Quote: "I sync, therefore I am." Like it or not, we leave bits and pieces of data about ourselves everywhere we go - whether physically or out in the cyber world. Some data, we willingly track - everything from sharing an email address signing up for a newsletter to writing a blog to inputting what we eat for lunch on some food site. Some traces, we leave behind unknowingly - outlined in the fine print about data tracked by websites we click on or join. The question arises - If all the data out there about any one individual was accumulated, what picture would it draw? Would we recognize that picture of ourselves? Right now, we freely give that data to companies who in turn use it to further their own profitability. What if, we, as individuals, took complete charge and ownership of our data and used it to further our own goals? Happiness economy - economic satisfaction that is not based strictly on income on profit but other measures of satisfaction. Gross national happiness - an attempt to measure the status of nation in more qualitative terms than traditional economic indicators. John C. Havens, the author, is a writer for Mashable, an online news source for the "Connected Generation". This book grew out of the work he did and articles he wrote for Mashable. The references to that work come up throughout that book. Therein lies the problem for me. I feel like I missed something in not reading the original work. The book includes some of the articles along with the reference back. For me, the book would be more successful and more cohesive without the direct references in the text. If this book is the culmination of all the research, then I would rather read about the research and the finding not where it was first published. An appendix, an index, or such may better deal with that information. That being said, I learned a lot from this book. It introduced me to new ideas. It presents a lot of research and references to back up the ideas. It presents concrete tools (such as technology and apps) to use in starting to manage our individual data. It presents a different perspective than some of the other books I have read on happiness research (for example, Less Doing, More Living which is mentioned in this book and Happier at Home). I look forward to exploring some of the tools identified in the book. Publication Information: Crown Publishers, Crown Publishing Group, Random House Inc. 2014. 461 pages. Favorite Quote: "I don't think humans as a species, are very highly evolved ... Look at all these people: they're all smart, well educated, meaningfully employed, living in the richest country in the world, surrounded by people who care for them. Still they're unhappy and misbehaving. What more do they need? What more do I need?" The Divorce Papers is literally a chronology of a divorce proceedings. The book tells the story through the official documents - affidavits, court papers, interview transcripts - and the correspondence - emails, memos, letters - associated with a divorce case. Sophie Diehl is a young attorney practicing criminal law. She has absolutely no interest in divorce cases. One weekend, however, her boss assigns her to conduct the beginning interview for a divorce case. The client is the daughter of one of the firm's most influential clients. All the divorce attorneys are away for the weekend. Sophie has no choice. Things become more complicated when the client Mia then specifically asks for Sophie to be her lawyer moving forward. Once again, Sophie feels she has no choice. She agrees. David, the partner who is Sophie's mentor but who also insists she take the case. Mia, the client who is an intelligent composed woman seeking to fight her influential husband and protect her ten year old daughter. Mia's father, a prejudiced man who is also one of the firm's key clients. Surprisingly, the book develops the characters and the storyline through these documents and correspondence. The divorce case proceeds, and the reader learns about the heartbreak when a marriage ends. The intrigues and politics within the firm continue with accusations, meetings, apologies, and other maneuverings. Along the way, the reader also learns about Sophie's personal life, particularly through her correspondence with Maggie, her friend who has nothing to do with the law firm but who acts as Sophie's sounding board and support system. It took me a while to get into the book, but it does pull you in. The book is a very quick read. I did find myself skimming through some of the more legal documents such as statute descriptions, reference case narratives, and settlement offers. Those sections add to the completeness of the story, but don't necessarily move the story forward. The story really "happens" in the correspondence. Those sections create the pace of the story. Through the correspondence, Mia and Jane's real and sad heartbreak comes through. Sophie's trials and tribulations come through and those are entertaining and sometimes laugh-out-loud funny. An unusual and entertaining book. Publication Information: Viking Adult. 2014. 356 pages. Favorite Quote: "Regardless of context or the company you keep, you are the most important person in your own learning. Your organization or team or boss might support or stifle feedback. Either way, they can't stop you from "learning." Douglas Stone is a lecturer at Harvard Law School where he teaches negotiations. Sheila Heen is also a lecturer at Harvard Law School and an instructor through the Harvard Education Series. They are both also partners at a consulting firm, and both spent time working at the Harvard Negotiation Project. This is the second book they have co-authored. Our life is spent giving and receiving feedback - conscious and unconsciously but virtually constantly. So much training and teaching time is spent on how to give effective feedback; yet, how to receive it is as important, if not more so. That is the topic this book tackles - what is feedback, why receiving it can be so challenging, what we can do to be more open to it, and how we can use it in personal and professional situations. As the book says, "Receiving feedback well doesn't mean you always have to take the feedback. Receiving it well means engaging in the conversation skillfully and making thoughtful choices about whether and how to use the information and what you're learning. It's about managing your emotional triggers so that you can take in what the other person is telling you, and being open to seeing yourself in new ways." The book is very well organized and clearly presented. It defines feedback and differentiates between different kinds of feedback. It talks about conflicting human needs to learn and grow through feedback and yet be accepted for who we are. The book identifies triggers that can determine reaction to feedback. It then delves into each of the triggers - specific situations, examples, and techniques to more effectively manage how each of us as individuals uses feedback. Each chapter presents a summary of key ideas at the end. While the ARC does not have an index, it does present a "road map" which is a detailed table of contents or really an outline summary of the book. In presenting ideas on accepting feedback, it also becomes a tool to use in giving effective feedback - two sides of the same coin. Wharton professor Adam Grant has included this book in his The 12 Business Books to Read in 2014. I recommend this book to business and non-business readers. We are all faced with feedback in our daily lives, and effectively utilizing the feedback can help improve our lives. Interestingly, I am left with one question. Would recommending this book to a particular individual be construed as feedback on their ability or inability to accept feedback? I think people may need to discover the book for themselves. I am certainly glad I did. Publication Information: Scholastic Press. 2014. 320 pages. Favorite Quote: "Home isn't just a house or a city or a place; home is what happens when you're brave enough to love people." As a ten year old, I think A Snicker of Magic is a very clever book. It has words in a story that I have never heard of. Felicity Pickle is a shy girl who plucks words out of the air and makes poems. She is growing tired of moving from town to town. When they come to Midnight Gulch, she wants to stay. The townspeople say that there is a still a "snicker" of magic left in Midnight Gulch. It is leftover from when everyone had powers. Everyone like the Brothers Threadbare, who were brothers and musicians but who became enemies. Felicity meets Jonah, who does nice things for everyone. She also meets her uncle, who failed in the music business. She decides to enter her school's talent show to stay in the town longer. Will she get over her fear of speaking in front of large audiences? Read the book and find out. I think the book is fantastic because it has a wide variety of character personalities from wanderers to musicians. Also, it has a great plot. Felicity wants to stay in this town because she thinks it's special, but her mother makes her move a lot. Will they stay this time? The book is magical because it talks about magic and curses and people who have powers. These are the reasons why I like the book. The book defines the title. A "snicker" is "magic leftover .... not good for much, not as fancy as it used to be - but enough to make it special." Twelve year old Felicity Pickle is looking for some magic. She is looking to settle down, to call a place home, and to find a place where she belongs. Her father is not around. Her mother has a "wandering heart" and moves Felicity and her younger sister Frannie Jo from place to place. Never staying. Never settling. Never making a home. The start of the book brings the three of them to Midnight Gulch, the town where Felicity's mother grew up. Her aunt Cleo still lives there and gives them a home. Midnight Gulch is a place that was once magical. Maybe, it still is. The townspeople tell the story of the Brothers Threadbare, with whom the magic supposedly left. Felicity learns about the Beedle, who seems to know where a need exists and who secretly meets it. Marking the entrance to the town is the Gallery, a large mural that once celebrated what made Midnight Gulch a wonderful place. The town revolves around the ice cream factory that makes esoteric flavors based on the people in town, including a flavor that makes you remember but does not give you the choice whether the memory will be a happy one or a sad one. Felicity herself is a word collector. She sees words around people and place and writes them down. Yet, when it comes time to speak, words sometimes fail her. In Midnight Gulch, Felicity thinks that perhaps she can find her voice after all. Throughout the book, the refrain repeats, "Your words matter more than you know." Felicity finds that all these things along with the friends she finds make her want to call Midnight Gulch home and want to convince her mother to stay. As an adult, I want to reach out and support Felicity - to encourage her to take the chances and to reassure her that things will work out. Young readers will relate to her need to belong, her worries over being the new kid, and her work to overcome her fears. I do have one concern about the way the book is written. I love words, but the repetitive nature of the word collecting sometimes overwhelms this story especially as some of the words are made up. Not all the words Felicity sees and collects are actual words. Also, the words are not a one time mention; made-up words like "spindiddly" repeat throughout the book. While I appreciate the creativity, I think that literature written for this age group should also focus on correct use of language. Overall, a host of interesting characters, a little bit of magic, and some intriguing town history all make this a fun tale to read. Targeted for Grades 3 - 7. Publication Information: William Morrow Paperbacks. 2014. 256 pages. Favorite Quote: "Everyone must reach a certain point where they have too many memories. So forgetting was just another sort of remembering. ... Forgetting was an ocean which enclosed islands of memory. It had currents, eddies, and depths. Sandbanks would sometimes appear and join up the islands, sometimes the islands would disappear." The Taste of Apple Seeds begins with a funeral and the memory of another death. Iris has returned to her grandmother's home to attend her grandmother's funeral. After the funeral, she discovers that her inheritance is to be this home, where she spent so much of her childhood. Surrounding each are the other women, the people they loved, the friends they sometimes left behind, and their secrets. This book is originally written in German and has been immensely popular in Europe, which led to its translation into English. The fact that it is set in Germany adds interest to the book. Until now, the only books I have read set in Germany have been those set around World War II. It was interesting to read a story of Germany not about the war. My opinion of this book shifted as I made my way through the book. The beginning of the book is a little slow and hard to get into. I kept looking for the story and for the story to move forward. Yet, the descriptions travelled between the present and the past and between the myriad of characters sometimes without a sense of continuity. I found myself creating a family chart to keep the characters and relationships organized. It took me a while to come to the conclusion that I was looking for the wrong thing. This book is more a portrait than a story. With that shift in my approach as a reader, I really enjoyed the middle part of the book, taking it for what it appears to be. It is a portrait of a family and of these women. Through Iris's memories, the reader gets a picture of each of these women - as individuals and in their relationships. Although at times it's a challenge to keep the characters separate, the descriptions are beautifully written. The ending of the book, however, diverts from that portrait approach, and quickly moves through a story. This story is hinted at from the beginning of the book - the reader knows that a young death occurred a long time ago. Throughout the book are hints as to what happened and what impact it left. Yet, when the book finally gets to telling the story, it appears somewhat out of place in the book. From this lovely slowly painted portrait of a family, the book turns to a hastily dramatized tale of a young girl. To me, it is rushed and melodramatic - too much so for the tone of the rest of the book. I wonder what impact the translation had on this book. What part of the story or the emotion got lost in translation? Publication Information: Beacon Press. 2013. 228 pages. Favorite Quote: "It is children who can change the future, if only adults will give them some guidance." Jeannie Marshall had visions of moving to Italy and of raising her family on a traditional Mediterranean diet - focused on fresh, local ingredients and focused on real food cooked and enjoyed together as a family. When she did relocate from Canada to Italy, she found some of what she was looking for. Yet, to her dismay, she found reliance on packaged foods, fast foods, and other such things to be as common in Italy as it was in her North American home. This led her on a journey to research why the change occurred, what influence it is having on children and the coming generations, and what needs to be done. This book - part research and part memoir of her teaching her own son to appreciate and enjoy "real" food - is based on her experiences. Topics the book addresses include the food industry, childhood obesity, school lunches, food marketing geared towards children, and the transition toward an increasing reliance on packaged foods. The book talks about government policy in North America and in Europe and its influence on the food industry. It incorporates examples from the author's own life and family. 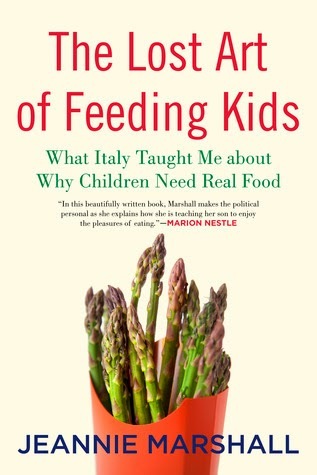 Finally, it delivers the message of the increasingly urgent need to re-examine the way in which we eat and the way in which we feed our kids. This book is not really new information; we all know that "real" food is the correct approach. This book is also not a cookbook or a specific how to guide - it's not meant to be. It is one family's experience. It is a comparison of two cultural approaches to food, and the influences of one on the other in a global food market. It is an examination of the food industry. It is a call to action to change our habits which will change the industry. Some of the research and information the book presents on marketing within the food industry, particularly on marketing to children, is somewhat disturbing. The industry actually uses something called the "nag factor" as a marketing measure. That means pretty much what you think it means. Children see an ad and start nagging parents for the food. The greater the nag factor, the more likely a sale of the product. There also exists a marketing company called the Girls Intelligence Agency, which recruits young girls to spread the word on upcoming products to their friends. The food industry is marketing to children and via children. I find the book fascinating. The research presented reinforces the need to focus our energy on the food we eat and on how we feed the children of the community. The personal anecdotes especially on cultural differences are interesting and add a lighter touch to the book. A really interesting book for anyone interested in food and the global industry that surrounds it. Publication Information: Broadway Books, Crown Publishing Group, Random House Inc. 2013. 356 pages. Favorite Quote: "Maybe I got so used to wanting something ... that somewhere along the way I didn't realize I didn't need it no more." The Funeral Dress is a story of growing up poor in the South. It is a story of strong women who support each other through whatever may come. Emmalee Bullard is a young woman living with her drunk and cruel father. She successfully manages to find a job at the local garment factory. This job brings her to a group of women, who are reluctant at first but them come to accept her as one of her own. In particular, the job brings her to Leona. Emmalee finds herself young, alone, and with a baby. Leona offers her support and a chance at a better life. Yet, before that comes to fruition, Leona dies in an accident. Emmalee finds herself alone again. This time, she is fighting to keep her baby, fighting to keep her independence, and still looking for that chance at a better life. Some help her. Some want to stop her. Some simply standby and watch it all happen. The book is a quick read. It is an interesting story. It is well written. The book does a lovely job of bringing the time period and the place to life. Strong female characters in a book are always promising. I just waited for something unexpected that would make the book stand out, and that did not come. Hence, the three stars. I liked the book, but did not fall in love with it. Publication Information: Ballantine Books. 2013. 474 pages. Book Source: I read the book based on how much I enjoyed another of the author's works, Loving Frank. Favorite Quote: "When you have a gift, it isn't yours to keep to yourself. It's the reason you're here. It's your purpose." So reads the inscription on the tomb of Robert Louis Stevenson. The Scottish writer is buried on the mountain top of Mount Vaea on the island of Samoa. The path leading to his grave site is called the "Road of Loving Hearts." This book tells the story of the love of Stevenson's life and the tumultuous path of his relationship with Frances (Fanny) Matilda Van de Grift Osbourne Stevenson. It begins with the story of how Fanny comes from America to Europe in the 1870s to study art, and what circumstances lead her to the quiet artist's colony where she meets Robert Louis Stevenson. From there, the book charts the course of their relationship until Stevenson's death in 1894. Fanny comes to Europe with her children to get away from her philandering husband. The relationship between Fanny and Stevenson flourishes even though she is married. The book follows their relationship. Does Fanny return to her husband? Does she stay in Europe? Does the relationship last? To what lengths will both go to be together? You can do a simple search on either person and get the answer or read it in this book as a beautiful story. Parallel to their love story runs the story of Stevenson's writing career. He comes from a family of lighthouse designer. Upon deciding that is not for him, he studies law. Ultimately, he decides - against his family's wishes - to pursue writing. He does not meet with much success early on, but goes on to pen books that are now considered classics. I was not familiar with the historical events before reading this book. I found myself doing research online to learn more about each of them and their children as I read the book. The book is fascinating because along with their story, it tells the story of the art community in 1800s Europe and draws a picture of a time and place. However, I did not find this book quite as compelling as Nancy Horan's first book. This book is also about 100 pages longer than that first book. This book, while a wonderful story, just seems a little too long. Publication Information: Workman Publishing Company. 2013. 409 pages. Book Source: I received this book through a publisher's giveaway free of cost in exchange for an honest review. The book arrived as a paperback edition. Favorite Quote: "America is not only a wide-open world; it's one world when it comes to food. Bold honors the great melange." Bold: A Cookbook of Big Flavors is described by the authors as "replete with recipes for the amazing, every changing round of dishes that make up American cooking today." The "bold" flavors in this book are not coming from spices. Most recipes call for salt and pepper and not many other spices. "Bold" is more a reference to the mingling of cuisines from many different cultures into what is now American cuisine. "Bold" is also a reference to the heartiness and abundance of food that immigrants to America found here. The book is organized into sections some centered around food types such as snacks, soups, and sweets. Some sections focus on ingredient categories such as meat, game, poultry, fish and seafood, and vegetables. This structure is similar to many other cookbooks that are general, all-purpose cookbooks. The book includes a detailed index which is helpful. The book includes periodic sections (clearly identified by color) with history and cultural trivia. They will interesting to any foodie. The start of each section does not include a list of the recipes in that section. I find that helpful to flip through when I am hoping to be inspired. The color choices for the printing start with a sepia toned paper and the text and pages colored in shades of browns and oranges. The titles of the recipes are printed in very large font, in a muted orange, and in all caps. The font and color choice are somewhat distracting from the recipes themselves. Many of the recipes call for ingredients such as heavy cream, cheese, butter, half-and-half. I would find myself modifying the recipes to incorporate them into our lifestyle. Overall, a general, all purpose cookbook. Publication Information: Alfred A. Knopf Books for Young Readers. 2014. 240 pages. Book Source: I received this book through a publisher's giveaway free of cost in exchange for an honest review. The book arrived as a paperback advance reader's edition. Favorite Quote: "Be kind to everyone who you meet along the way, and things will be well. Kindness is far stronger than any cruelty. Always extend your hand in friendship. Be patient. You may feel alone, but there will always be people who will help you along the way. Never, ever give up." Ophelia and the Marvelous Boy was a fantastic book. Ophelia has come to a new town where her dad has a new job at a museum. Ophelia finds a hidden room and finds a boy. That boy is the Marvelous Boy, trained by wizards and sent to stop the evil Snow Queen. The boy wants Ophelia to help. Ophelia has to find keys to unlock the door to the room where the Marvelous Boy is trapped. After she does this, they still face a harder challenge to stop the Snow Queen. I would rate this book five stars, which means I really love this book. I love the author's creativity. For example, the author came up with these creatures that Ophelia meets when she is finding the keys. I also like it because it was a mystery. You don't know who the evil Snow Queen is. You also don't what the Marvelous Boy's real name. You also don't know who the “Other One is.” All these things make this book have a great storyline. I also liked it for the family situations. Some people might relate to things like having problems with siblings and parents having a new job. These are all reasons I like the book and I recommend that you read it. Ophelia is spending a week in a foreign city at a museum with her sister and her father. Her father is the curator of an exhibition on swords of the world that is set to open at the museum in three days. The girls spend their days exploring the museum, and their father spends the time working. In her explorations, Ophelia comes across a locked room. Peeking in through the keyhole, she meets the Marvelous Boy, a little boy whose name has been taken, who has been looked away for a long time, and who asks for Ophelia's help. He is the keeper of the prophecy from the wizards of long ago that he had to take a special sword to the "Other One" who would then defeat the Snow Queen and save the world. Thus begins Ophelia's adventure. Ophelia is a girl of science and does not believe in wizards and prophecy. Despite her disbelief and her fears, she decides to help the Marvelous Boy and to hear his story. Along the way, she overcomes ghost girls, snow leopards, and misery birds, to name a few of the obstacles she faces. She also faces Ms. Kaminski, the museum director. This book is a story within a story. Ophelia is struggling to cope with the death of her mother, the withdrawal of her sister Alice, and her father's inability to help her through the sadness. The Marvelous Boy's story is one of taking on a responsibility that he did not feel capable of, of losing his mother with only a slight hope that he may return, and of being the nameless boy who never grows. The book is delightful. It has adventure - magical creatures, prophecies, and wizards. It has two little motherless children looking for friendship. It has a positive message. The boy is chosen "because he is so good" and the direction he is given are about kindness, friendship, patience, and perseverance. A wonderful read geared for ages 8-12. Please share your thoughts and leave a comment. I would love to talk to you. Publication Information: Atria Books. 2014. 384 pages. Favorite Quote: "There are more questions in the world than answers. A wise man once said you have to live the questions and then one day you might live your way to into the answers. It's how I've conducted my life. Magic is real, my dear. Just watch a tree grow." The Collector of Dying Breaths is part history, part romance, and part adventure. The book proceeds in two time periods - current day and the court of Catherine de' Medici, who was the queen of France in the 1500s. In the 1500s, Catherine de' Medici's power in increasing as are the intrigues of the court and the threats to her power. René Le Florentin is her perfumer and her confidant. She saved him from almost certain death at the monastery where he was left as an orphan. He brings with him the secrets of the monks in making beautiful perfumes and other potions designed to accomplish more sinister objectives. He also carries with him his mentor's secret project - research into capturing the final breath of someone dying and then finding an elixir that will enable that breath to find new life. How far will Rene Le Florentin go to serve his queen? How far will the queen go to ensure her power? In present day, Jac L'Eoile is recovering from her brother's death and still coming to accept the fact that she has memories of her past lives. Her family has long created and sold perfumes. She has paved her own way in an entirely different field of work. Upon her brother's death, she comes to find that her brother was working on a project for the wealthy Melinoe Cypros. The project involves sixteenth century artifacts and the ability to give new life to someone who has died. Melinoe Cypros has bought the house and the lab that once belonged to René Le Florentin. Melinoe's objective is to see his work on the "dying breaths" completed for her own purposes. Will Jac finish what her brother started? How far Melinoe Cypros go to ensure that she gets what she wants? Thus goes the story, back and forth between the two time periods - each with their own intrigue and each with their own love story. René and Isabeau. Jac and Griffin. The Collector of Dying Breaths is part of a series of books. It is in fact the sixth book in the Reincarnationist series. I did not realize that before I read the book. I also did not realize that I have read The Book of Lost Fragrances, which is book 4 in the series a couple of years ago. That being said, the books really do stand alone and can be read without having read the others. The history in this book is intriguing. The romance adds interest. The adventure makes it a fast paced story. The environment of René le Florentin's estate add a Gothic element. All components of a successful book. What makes the book less successful for me was the interjection of physical descriptions of the "flowing juices" of life. I felt that those were unnecessary and distracted from book. Other than that, a light, quick, and enjoyable read. Publication Information: Bloomsbury USA. 2013. 272 pages. Favorite Quote: "My entire community suffered from a lack of trust: we didn't trust society to provide the basics of a good education, safety, access to good jobs, fairness in the justice system. And even as we distrusted the society around us, the culture that cornered us and told us we were perpetually less, we distrusted each other. We did not trust our fathers to raise us, to provide for us. Because we trusted nothing, we endeavored to protect ourselves, boys becoming misogynistic and violent, girls turning duplicitous, all of us hopeless." Jesmyn Ward lost five young men - close to her in the very short span of five years. They all died of different causes - accident, suicide, murder, drugs. However, one reason underlies all their lives and deaths - the fact of who they were and where they were. This is their story and her story. and when we came to get in the crops, it was dead men we reaped." A powerful image for a powerful narrative. Home for Jesymn Ward is the small town of DeLisle, Mississippi. Delisle is a very small town with a population of a little over 1,000 people. According to the Information Please database, Mississippi is 48.6% male, and 51.4% female. Racially, Mississippi is 59.1% white, 37% black, and the remaining a combination of other races. Historically, the state has had one of the lowest per capita incomes in the country; according to 2007 census data, the state was ranked 50th - dead last. In the eighteenth Report Card of American Education, Mississippi's rank is 48th. This data is current. Imagine what it was ten years ago, when these events took place, or 20 years ago when these young people were children, or 30 years ago when they were born. This is the environment into which these young people are born and in which they are raised. Not encouraging even if a child is born into privileged circumstances. Imagine if you are born a minority and poor. That is what they faced. A lack of opportunity and a lack of hope. This narrative starts at the beginning and the end of the story. It alternates between the story of Jesmyn's childhood - the beginning - and the stories of the young men starting with the most recent death - the end. The story of Jesmyn's childhood explains the context, the community, and the culture in which these young people live. This context is critical because "learning something about our lives and the lives of the people in my community will mean that when I get to the heart ... I'll understand a bit better why this epidemic happened, and about how the history of racism and economic inequality and lapsed public and personal responsibility festered and turned sour and spread here." The story of each young man is a memory of the boy / man that he was and the tragedy of his death. These were young men with the understanding that "what it meant to be a man [was] resentful, angry wanting life to be everything but what it was." It concludes somewhat at the middle and the end of the story. We are left with the death of Jesmyn's brother - the first of the young men to die, and we are left with those who live on. "We who still live do what we must. Life is a hurricane, and we board up to save what we can and bow low to the earth to crouch in that small space above the dirt where the wind will not reach." This narrative left a lasting impact on me. Two questions will stay with me for a long time: Jesmyn Ward wrote her story. How many more stories like hers are out there that go untold? How does still happen in modern day America? As a book, my most favorite and least favorite part of the book is the fact that it is written as a narration - one individual telling a story to an audience. The writing style is my favorite part because it conveys the courage and fortitude it took to write this story and to survive the life described. No words could truly ever capture what Jesmyn Ward attempts to capture. Even she concludes with, "This story is only a hint of what my brother's life was worth ... It is worth more than I can say. And there's my dilemma, because all I can do in the end is say." The writing style is also my least favorite part of the book because it creates a distance between the narrator, the story, and the emotions. As a reader, the narration also creates that distance for me. It becomes more of an intellectual understanding of some of the things she faced rather than an emotional absorption into the people and the events. As a book club read, this book had an interesting result. Unequivocally, we were all impacted by the book and shared the feelings described here. That is positive in that it proved to be a powerful read for all of us. However, some of our most involved discussions come from the books in which individuals reading have differing takes on the book. This one resulted in less discussion of it as a book because this one I loved and our entire group loved.